A brief description of your train journey. Platform 3 on Aviemore Station is where all timetabled services of the Strathspey Railway depart from. Aviemore is located in the heart of the Monadhliath and Cairngorm Mountains and is the perfect location for those who enjoy the outdoors and spectacular views. The train takes you past heather-clad moors and woodland travelling parallel with the Speyside way. Five miles further along the line the train stops at Boat of Garten. Aviemore to Broomhill Single or Return tickets with an option to break your journey at either Boat of Garten or Broomhill stations. 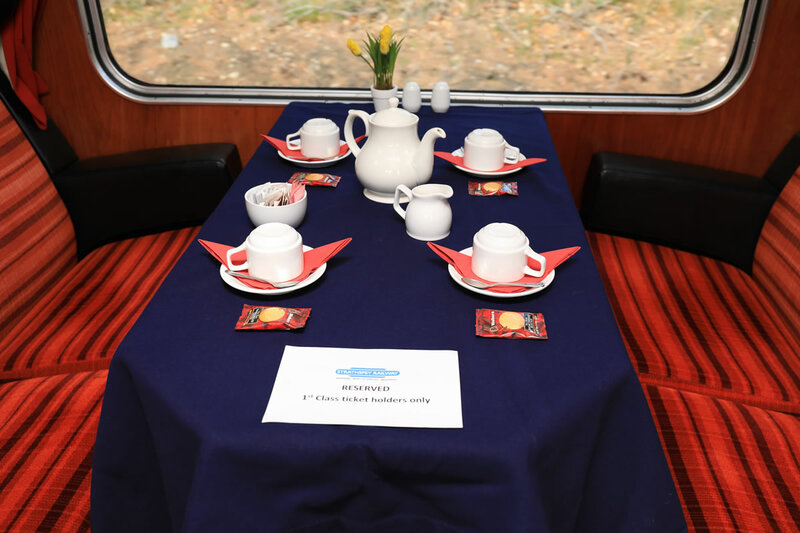 Why not travel out on the first train of the day and return to Aviemore on the last train service 15.50 from Broomhill or 16.08 from Boat of Garten? (Booking not essential except dining). Rover Tickets are also available, these tickets allow you to travel on all trains all day. Prices – Adult £23.75, Senior £20.40, Child £11.25, Family £60.00, Under 5 Free. 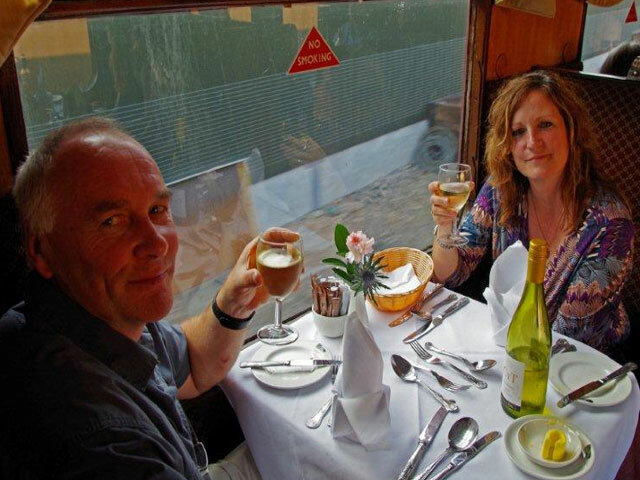 Why not consider upgrading to first class travel? 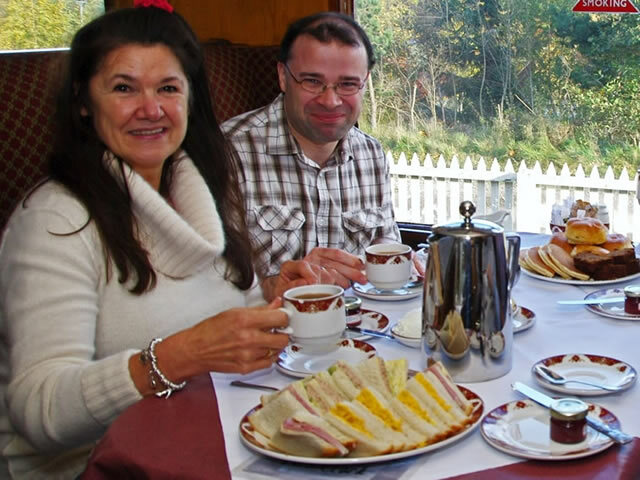 First Class for up to 6 people is available on the 10.30 service only with complimentary tea/coffee and biscuits. 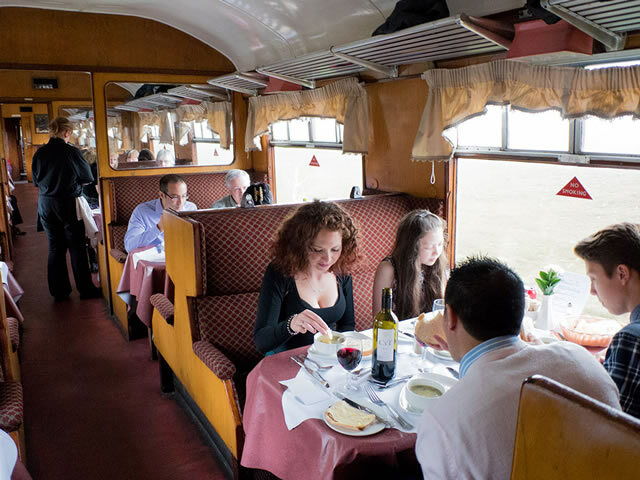 (Journeys cannot be broken when travelling first class on any of our services). As you enter Boat of Garten (also known as The Osprey Village) you will see one of the area’s finest golf courses, designed by James Braid and created by locals and railwaymen! The RSPB observation hide at the Osprey Centre is situated 5 miles from the village and is best visited during summer, when the Ospreys return from the warmer climates of Africa. There are also plenty of walks and cycle trails, perfect for families, couples or groups exploring the area. Five miles from Boat of Garten, heading north alongside the river Spey, brings you to our Broomhill Station, the current terminus of our line. The Station originally served the nearby villages of Dulnain Bridge and Nethy Bridge on the original Great North of Scotland Railway line. The forests in this area offer real diversity – there’s plenty of wildlife and nature to explore here. The views from Broomhill are well worth making the journey by train. Make sure you get off the train at the Station, there’s photo opportunities with the scenery and you can walk up to the locomotive to meet the driver and fireman and perhaps get some photos on the footplate. The train then returns to Aviemore along the same route, stopping again briefly at Boat of Garten station before reaching the terminus at Aviemore station. Travel Tickets are available to purchase at both Boat of Garten and Broomhill station but are not available to purchase on line.